Ninebark (Physocarpus opulifolius): growing, planting, caring. Physocarpus, commonly called ninebark, is a genus of flowering plants in the family Rosaceae, mostly native to North America. Physocarpus are deciduous shrubs with alternately arranged leaves. The leaves are palmate with 3 to 7 lobes and often toothed edges. The inflorescence is a cluster of bell-shaped flowers with 5 rounded white or pink petals and many stamens. The fruit is a flat follicle. 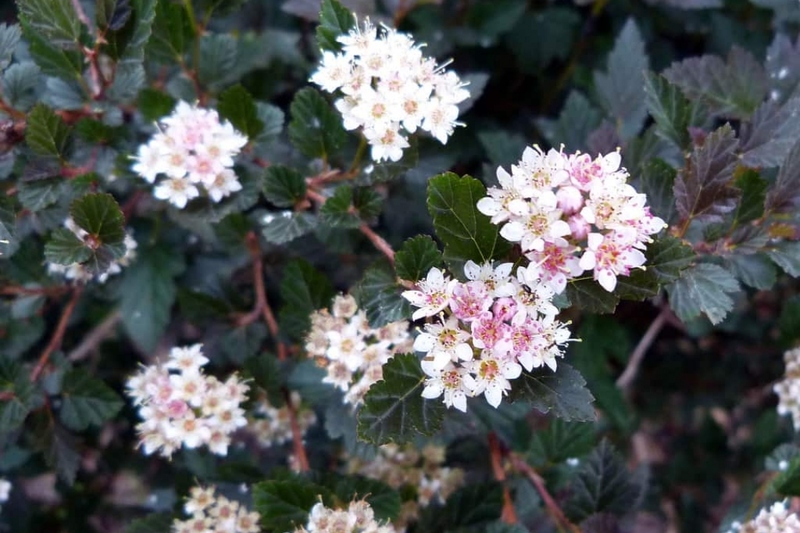 Its common name ninebark refers to the peeling bark of mature branches, which comes away in strips. Physocarpus opulifolius is cultivated as an ornamental plant. Several cultivars have been bred, particularly for foliage of varying colors, including 'Dart's Gold' and 'Luteus', which have yellowish leaves, and 'Monlo' and 'Seward', which have reddish purple foliage. The ninebark is a large shrub of neutral or acidic ground. Plant it in well-drained, deep soil, in the sun or partial shade. In hedge keep a space of one meter between each foot, and otherwise at least two meters. Dig a hole two or three times as big as the root ball, keeping the soil layers in the order you pull them out. Put the bottom soil back and place your shrub at the right height. This is when the root-limb boundary is at ground level. Put back in the rest of the soil gradually by tamping it regularly with the foot. Water copiously to help the earth settle back around the roots. Mulch with dry leaves or crushed wood. Every year, in July you can cut the ends of the stems that have bloomed, but it will stop the growth of any decorative fruits. In spring once every 3-4 years you can fold down to ground level your physocarp. This removes all the old twigs and gives the shrub a younger appearance, to the detriment of the bloom of the year.